Hello Dosto, Aaj is post me main aapko basic full form in computer btane ja raha hu Aaj ke time mai computer ka knowledge hona bhut jaroori ho gya hai har chiz ka online hone se iska use bhut bad gya hai aapko computer knowledge ke saath saath computer related full forms ka pata hona bhi bhut jaroori hai. To niche me aapko computer full name ke sath sath all basic full forms in computer provide kar raha hu aap inhe pad kar apna computer knowledge increase kar sakte hai. Wese dekha jaye to computer ki koi official full form nahi hai lekin computer ko samjne ke liye iski ek full form banai gyi hai jo mai aapko btane wala hu. COMPUTER:- Comman objective machine practically used in trade, education & research. 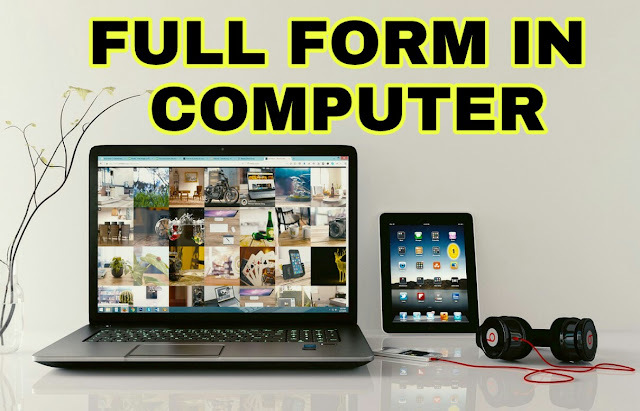 Ab aap samaj gye honge ki computer full form kya hai or computer ka use kaha kaha hota hai ese hi coumputer related full forms janne ke liye aap puri post read kare.